2018 marks the 50th anniversary of Cooperating Raleigh Colleges, a nonprofit promoting higher education collaboration in Raleigh and throughout Wake County. The six member institutions — Meredith College, NC State University, William Peace University, Saint Augustine’s University, Shaw University and Wake Technical Community College — bring students, faculty and staff together to foster creativity and problem solving to benefit campuses and the community at large. CRC promotes educational and cultural objectives of member institutions by encouraging and fostering cooperation and understanding, increasing educational options for students, increasing member institutions’ visibility, sharing the use of educational facilities, promoting the role of higher education in the region, and providing opportunities for joint initiatives among member institutions. The nonprofit’s formation came from a desire to broaden the areas of study for students. In 1972, an agreement provided that members of the CRC community have open use of the library facilities on all member institutions’ campuses. The combined collections of the current CRC member libraries now exceeds five million volumes. Today, any full-time student may cross-register for classes at another member institution for free. Additional development opportunities include emergency and crisis management workshops and the annual Library Workshop, held most recently in July 2018 at Hunt Library. The NCSU Libraries also boasts the largest library system in the CRC, due to interlibrary borrowing relationships with other research-level consortia such as the Triangle Research Libraries Network. For more than 25 years, CRC has administered the CRC Education Channel. This public access channel — channel 18 on the Raleigh Television Network — provides another means of increasing knowledge among member institutions by sharing their campus information and events. To demonstrate higher education’s importance to the region, CRC will release the results of its latest economic impact study — conducted by Michael Walden, William Neal Reynolds Distinguished Professor and extension economist in the College of Agriculture and Life Sciences — on September 24. The reveal will take place during CRC’s 50th anniversary celebration at the North Carolina Executive Mansion. 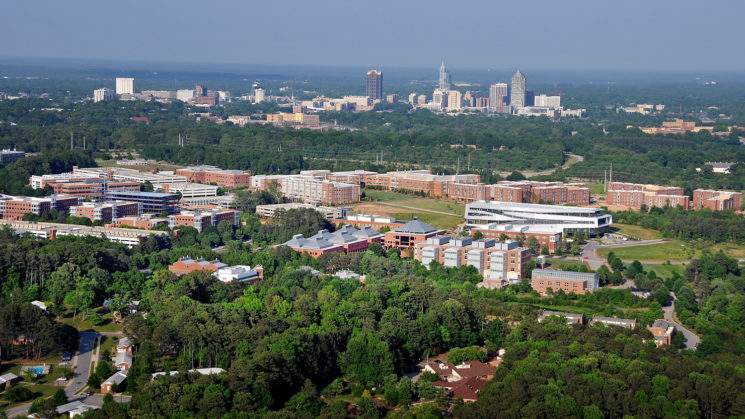 CRC will showcase efforts to serve higher education institutions and citizens of the greater Raleigh community. The event will include an address from Governor Roy Cooper and networking with campus leaders, state legislators, Raleigh city council member and community influencers. Looking ahead to the future of CRC, Spiker hopes to strengthen the ties between member institutions and grow the organization’s reach within the community. Reaching these goals will involve efforts to promote diversity amongst campuses and support entrepreneurship efforts that will benefit all campuses and the community at large. This post was originally published in Provost's Office News.